You often hear about professional game developers leaving the industry and choosing to work on indie titles instead. Don’t let that fool you into thinking indie games are only meaningful for people getting out of the commercial industry. You can break into the industry by working on indie games too. Indie titles not only give a creative and relaxing outlet for industry vets but, they can also prepare you for a full-time job at a professional game studio if you have never worked at one. Sure, working on a small mobile game or a web game is great and all, but, it pales in comparison to having worked on an XBLIG when it comes to getting a job as a full-time traditional (console) game developer. My buddy, Andy, and I started working on our indie game, Spoids, in 2010. At the time, he was finishing up school and I was working as a Java programmer for a small company. After working on this XBLIG (Spoids) for a little over a year, Andy eventually got a job as a Network Administrator / Tools Programmer and I finally got a job as a Gameplay Programmer at a professional development studio. Now it wasn’t as simple and easy as it sounds. I had applied for game development jobs throughout the years with no success. I had a Computer Science degree and had worked on lots of little PC game demos. However, it wasn’t until I was just about done with Spoids when I was actually able to start getting phone interviews at studios I was applying to. Before then, it always ended in an automated email saying the position was filled without having spoken or hearing from anyone at these companies. So what made the difference? I had worked on an XBLIG with as high production values as we could muster during our free time. I’m not saying you have to make the next big viral indie game or something super innovative. Just work on something that requires some challenge and do a solid job at it. Make sure to finish it all the way to the end and polish it up as much as possible. The more well done it is, the better chance that professional developers will think you are capable of joining their team. 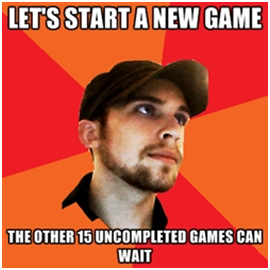 Don’t just get a proof of concept game going and stop halfway. The majority of the game development battle is in that last 20% of completion. You’d be surprised how many people who work on game projects as a hobby never actually finish a game to shippable quality. You can be the smartest, most talented indie developer out there but, if you can’t connect with your co-workers in their other fields, then it’s going to be a nightmare for both sides when it comes to working on a professional team. Programmers – Make the game work. Give content developers the tools they need. Producers – Keep the project scope manageable, decide what everyone works on. Designers – Make the game fun, place all the content. Audio – Make the game sound good. Artists – Make the game look good. Quality Assurance / Testers – Make sure everything looks and works properly. There is a lot more to each of these disciplines but, this should give you a rough idea of what each sub-team deals with. So, what does all of this have to deal with how XBLIGs prepare you for a career in game development? Everything. Usually teams that work on XBLIGs are pretty small (1 to 5 people). That means most of those people have to deal with things that aren’t their forte. Sure, you have your dedicated programmers or your dedicated artists but, chances are everyone had some kind of involvement with designing the game, the layout of the levels, tracking and fixing bugs, dealing with audio, keeping the project moving, balancing, etc. Dabbling in each of these areas lets you see the challenges and issues that arise in those fields when it comes to developing a game. This becomes more helpful than you think when you work on a full professional team. No, you likely won’t be crossing boundaries much in a professional studio like you do working on an indie game. However, you can level a lot more with the other fields and work together to find solutions since you can see things from their point of view. For example, if you are a programmer at an industry studio after having worked on an XBLIG, you can likely level with, understand, and communicate better with the designers you work with. Or you are more likely to sympathize with the people who work on audio and be able to develop the right tools they need to more easily get their job done. Why? Because you had to walk in their shoes a little bit while you worked on an XBLIG. You probably didn’t thoroughly enjoy dealing with something on your indie game whether it was design, audio, art, etc. But seeing how those assets are created and the challenges these people face everyday allows you to better understand their issues and work better with them. People in one discipline can easily start to become jaded towards those in other disciplines. So it doesn’t take much to start to feel a little irritated over time when you are getting work requests that you feel are “stupid” from the workers in the other fields. So again, getting to walk in their shoes for a little bit can really open your eyes and show you the walls they run into everyday. They have a hard job too. Doing what you can to help make their lives easier will make you more desirable as a co-worker. Game companies get tons of resumes every day. The more high-profile the company, the more they get. And we’re not talking about two or three every day; we’re talking about tens to hundreds. As much as career guides and counselors preach resume format or getting good grades, the single biggest thing you can have is to show you have actually worked on and finished a game or a mod. And if you have actually released something, then you’re definitely going to get put in the consideration plate over other applicants. Not only that, but showing you have worked on a game for a console will garner even more attention since there are more technical limitations with a console than with computers. Now, a lot of these points so far can be made for working on any kind of indie game, not just an XBLIG. However, the key aspect to what makes working on XBLIGs compelling is that they are made on one of the major home consoles. This is where you gain a lot of knowledge that you wouldn’t get working simply on PC or mobile indie games. Memory is very precious on consoles whereas today’s PCs have oodles of memory to use. Because of this, worrying about too much memory usage on a PC isn’t usually a big problem. But on consoles, that is not the case. You have to be a bit more cautious of your memory usage. This includes XBLIGS. Being able to manage your memory usage is a good skill to have going into a professional studio. It is a constant limitation everyone deals with from the programmers to all the content creators. If you’re not cognizant of how much memory you are using when developing something at a professional studio, many upset faces will follow you. And if you are lucky, they won’t beat you up when you walk down the dark hallway. When a game is released on the PC, it doesn’t have as many rules to adhere to as a console game would. This is because console makers like Microsoft, Sony, and Nintendo make sure there are certain standards that are adhered to before you can ship a game on their consoles. XBLIGs are no different. Microsoft tells their peer reviewers that Xbox indie games must pass ALL of the certification requirements they have outlined. 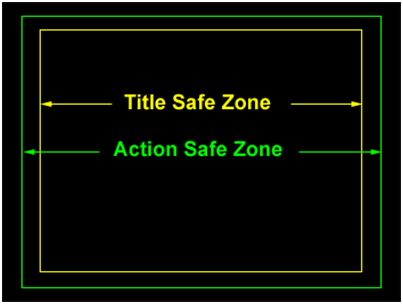 One example of an everyday console certification requirement is keeping your important game information inside the “safe zone”. A lot of TV’s actually don’t show the entire image that is projected to the screen. When it comes to 720p/1080i HDTVs or old CRT TVs, a handful of the screen around the edges isn’t actually shown. Thus, important game elements shouldn’t be displayed on the direct edges of the screen space. Otherwise, they might get cut off. Typically, you want to keep a five percent border on each side of your screen free of anything important the gamer would need to see. Thus, the inner 90% of your screen space is called your “safe zone”. This isn’t only done in games; it is done for TV shows too. 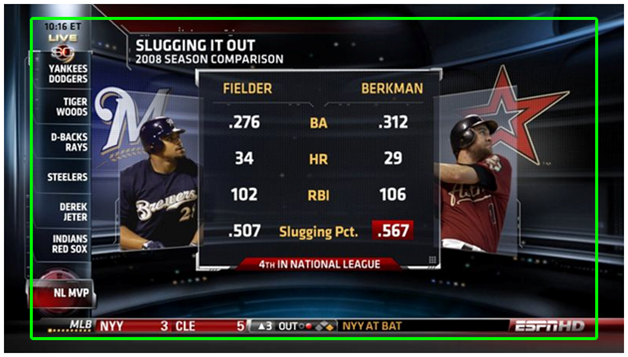 For example, ESPN keeps all their text information within the inside 90% of the broadcasted screen space (the safe zone). The image below shows their text information not going to the edge of the screen and keeping a nice five percent border on each side. Now, PC games don’t have to deal with this. Computer monitors will show the entire screen space. Thus, they can render important parts of the game on the very edge of the screen if they want to. So, if you ever ship an XBLIG, this is an issue you will be dealing with while developing your game. Now, there are a myriad of other certification requirements to deal with on consoles: minimum font sizes, allowing the primary player to play off of any connected controller, being able to select any storage device, being able to handle a hard drive being pulled out during save/load, using player profile settings for default control schemes, pausing the game when a controller becomes unplugged or their batteries die, maximum load times allowed, etc. Each of these issues has to be addressed when it comes to professional console games as well as XBLIG titles. So, if you ever finish and ship an XBLIG, you will likely have dealt with all of the above, and thus be better prepared for this in the professional scene. A lot of these can be annoying and frustrating when you first learn that you have to deal with them. You’re better off getting annoyed by these on your own personal projects first and not later at a professional company. One of the last big things that you can gain from working on XBLIGs is that you will get better at cross-platform development. Chances are you will have the game working on both Xbox and PC. In fact, you may even do the majority of your testing with your PC build. And since you need the game to run on both systems, you will want your game to be easy to develop and maintain for both systems. Thus, you will need to exercise good programming and abstraction strategies as you go so both builds share as much of the game code as possible. If you have done nothing but PC games and have constantly used the same third-party software, you will likely not be very prepared at writing well abstracted and managed code. Heck, you will probably hate yourself the first time you try to port your game to a different platform once you’ve finished it. It is not simple to work on a game that needs to work well with an Xbox controller, mouse and keyboard, TV’s, monitors, the Xbox’s specific hardware, any random amount of hardware configurations from a consumer PC , etc. This is not something that comes naturally as you learn the basics of development. You only get better at this from repetition and learning from mistakes. XBLIG’s present a great situation for getting better at and perfecting your cross-platform development abilities. It’s quite an important skill for professional studios, who a good number of them work on games that run on the major consoles as well as PCs. In short, working on and finishing an indie game lets you see how each of the major disciplines work together to make a finished product. But working on a console game, like an XBLIG, let’s you see and learn a lot more of what AAA studios have to deal with on a daily basis. These skills will not only make you more appealing to hiring managers at studios, but it will just make you a better developer overall. Is the XBLIG platform fading into the sunset? Yes. Are there easier frameworks to start writing a game on such as Unity? Sure. But, there aren’t really any other cheap and easy ways to ship a game on one of the major consoles besides the Xbox 360. So, go ahead and try making an XBLIG; you’d be surprised where it takes you. Heck, it took me finishing Spoids to have what I needed to finally break into the industry. The same might happen for you. Roby is currently working on South Park: The Stick of Truth. Make sure to check out Spoids. It’s Chick-Approved. An outstanding article for aspiring & fledgling indie devs alike; finishing a game & releasing it to as polished a standard as you can is often where I think new devs struggle the most. Wonderful to see how XBLIG has enabled you to create a game good enough to get you working in the triple A industry & I’m more than looking forward to ‘The Stick of Truth’. Cracking stuff! Very well written article, I agree with your points here a lot. Recently I asked a manager of Riot games Vladimir Cole whether getting indie experience was a good way to get into the company. his response was “Indie game development is an *excellent* path to making yourself very employable when you’re ready to start pursuing career opportunities. It demonstrates passion, capability, and entrepreneurial energy, all of which are great.” Definitely very motivating to have that confirmed. Excellent article!!! So true that indie developers have to “walk a mile” in other people’s shoes, giving them the knowledge needed to understand the point of view of team-members specialized in other disciplines. Indeed, XBLIG is a low-risk market where we can invest as little as $99.00 to publish world-wide. All tools needed are given for free, including access to forums and on-line reference documents! To the article’s point, it really draws attention when someone says that he or she has published games for the XBOX console. The XBox can definitely be limiting. I remember when I was working on my last XNA game, I had a few hundred block models on the screen which made up the game world. This ran fine on my PC, but when I deployed it on the XBox it made my game slow down to a crawl. Then I had to start learning tricks (model instancing/texture atlasing) to get the game to run on the XBox at the same speed. I’m surprised that this article didn’t touch on the marketing role in game development. To me, that was the most valuable learning experience from releasing my first XBLIG. Things like dealing with press kits, review sites, and just getting people to talk about your game to generate a buzz. 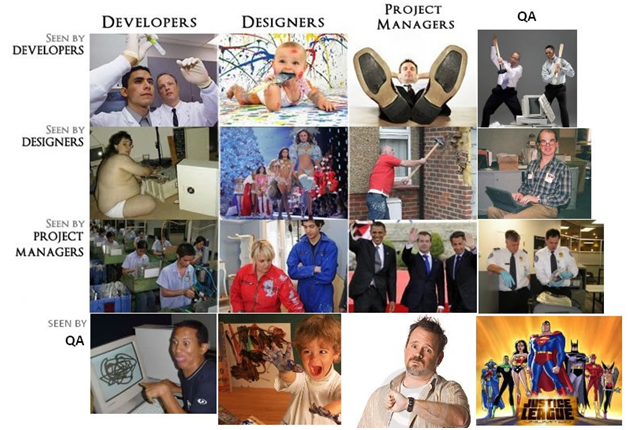 Great article and great ‘Roles as Seen By” image.